There, that’s one thing I’ve learned, ha! Even for the non-developer, WordCamp is a great place to hear developers talk about their craft. Greater still to learn how their craft is applied to WordPress. I file away bits of info so I know what kind of features I can offer in a design without incurring a lot of custom development time, saving the heavy custom work for really important features (or rich customers!). I learn what plugin software is well-regarded and well-supported so I can give intelligent answers when clients inquire about adding features to their sites. There are designers who present at WordCamp, my friend Michelle is giving a design-oriented presentation, so some content is aimed right at me and my kind. Perhaps most of all, I attend WordPress because it exemplifies the ideals of open source. Helping out your fellow professional, sharing information, techniques and even your IP. The design community could learn a lot from the development community in this regard. In my little corner of the design world, I feel some of us are learning. We are a stronger profession when we support each other. Holding back and letting others fail when we could have helped is no way to be. Helping your colleagues, even competitive colleagues, will be paid back in the long run. 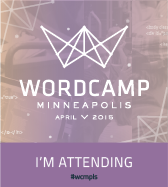 WordCamp Minneapolis 2015 will be held at the University of St Thomas in Downtown Minneapolis on April 25 – 26, 2015. Got your own blog? I can help you fill it with amazing content!